The dream of large OLED screens has, for the past few years, seemed perpetually on the horizon. LG has had OLED TVs on the market for a while, but they're still far more expensive than comparable LCDs. If you've wanted to get your OLED fix recently, you'd have to get it on a smaller phone or tablet screen. Now, the technology is finally making its way to laptops from the likes of Dell's Alienware, HP and Lenovo. So you can bet that I jumped at the opportunity to test out the new OLED-equippedThinkpad X1 Yoga as soon as review units appeared. For the most part, it's a pretty typical Thinkpad convertible PC, but its screen is truly a thing of wonder. 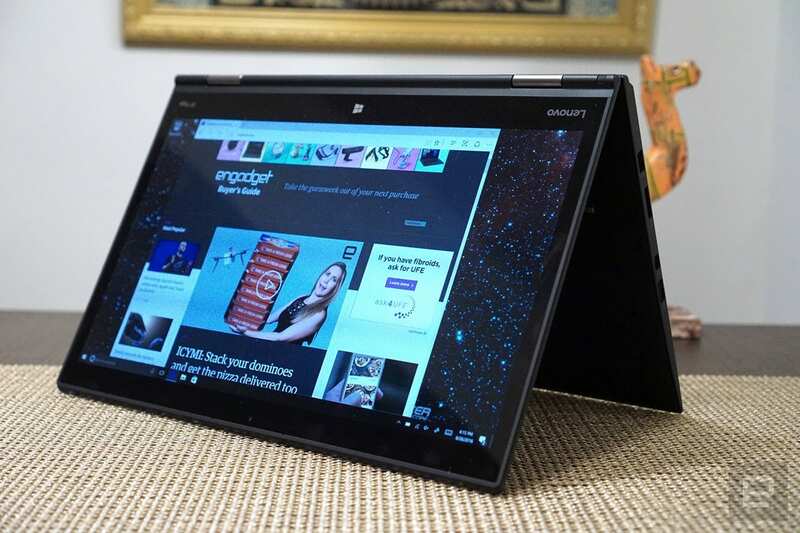 The OLED edition of Lenovo's X1 Yoga makes a good argument for moving past LCD screens. Its display is bright and vibrant, but you'll pay a premium for the privilege of using it. While it's built like a workhouse -- there's no flex to the case, and it feels like it could survive some major tumbles -- the X1 Yoga is also impressively portable, at 2.8 pounds and 0.67-inches thin. 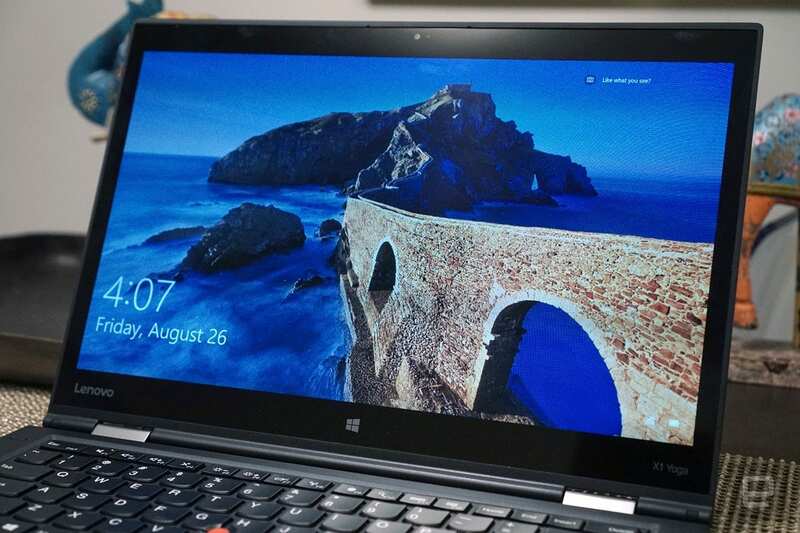 That's about on-par with most other Ultrabooks (and it's even 0.2-pounds lighter than the 13-inch MacBook Air). It's not as razor-thin as HP's stunning new Spectre, but because of that it's surprisingly versatile, with three USB 3.0 ports, HDMI and miniDisplayPort connectors, and a microSD card slot. There's also a proprietary OneLink+ port for connecting to Lenovo's docks, as well as a fingerprint sensor to the right of the trackpad. Being a Yoga device, the X1's screen can bend a full 360-degrees around the case, effectively turning it into a very large tablet. (In that mode the keyboard also recesses into the case, to prevent stray strokes and key damage.) You can also fold the screen over at an angle in a "tent" formation. That's ideal for standing it up on a table, or on your lap in bed. Lenovo designed a new double hinge for this device, and it's one of their smoothest implementations yet. The screen is easy to move around, but it also feels secure once you set it in place. 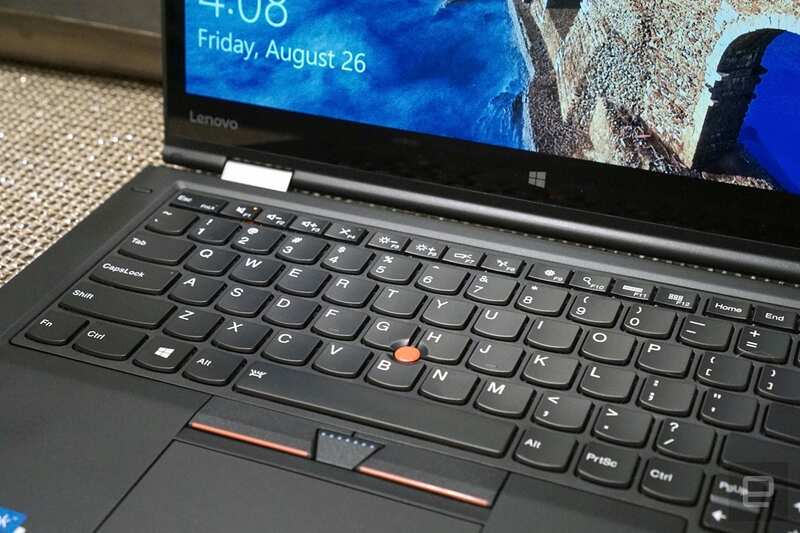 Lenovo also tucked a stylus into the side of the X1 Yoga, which is useful for drawing or quickly jotting down notes. It's powered by super capacitor technology, which charges it whenever it's sitting inside the case. The X1 Yoga's OLED display doesn't waste any time impressing you. The red border around Lenovo's logo has an almost electric feel upon boot-up, and that carries over to everything in Windows. OLED displays are known for their bold colors and deep black levels, and this one doesn't disappoint. Watching videos and perusing photos is a revelatory experience. OLED adds an enormous amount of depth to images that makes them seem almost three-dimensional. With a resolution of 2,560 by 1,440 (1440p/2K), the X1 Yoga's OLED screen is significantly sharper than a 1080p display, though it's not quite 4K. That's just fine, though, as Windows 10 still isn't well suited to 4K, and the benefits of such a high resolution are wasted on laptop screens. The X1 Yoga might not look like an ideal media machine from afar, but it ended up being one of my favorite ways to watch Netflix in bed. Mostly, that was due to sheer immersiveness of the screen. Its speakers sit right below the screen, and as is usual with Lenovo's gadgets, they were merely adequate. If you really want to get into a movie or TV show, bring along a good pair of headphones. The laptop's ability to flip around in a variety of different orientations also made it very useful. When I needed help in the kitchen, the tent formation was perfect on my countertop for watching videos and references recipes. And when I wanted to dive into the NYT, Comixology or a digital magazine app, the tablet mode was immensely convenient. It also worked well in direct sunlight, but be prepared to deal with some reflectivity depending on how it's oriented. While the built-in stylus was convenient for jotting down quick notes, it's also too light and flimsy to use for a very long time. 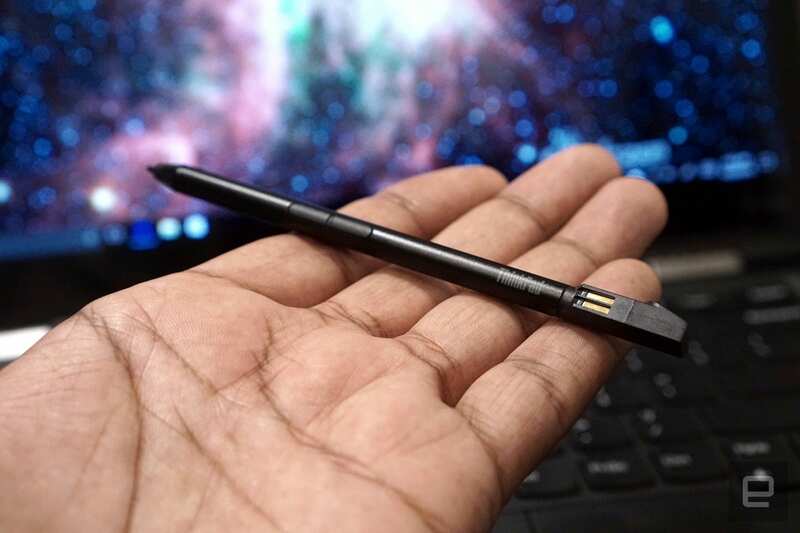 It doesn't feel as substantial as Microsoft's Surface Pen or Apple's Pencil, instead it's like trying to write with an incredibly skinny pen. If you're really looking forward to handwriting on the X1 Yoga, though, you're probably better off investing in something that won't cramp your hand after a few minutes. On the plus side, the stylus is pressure sensitive, which could be useful for artists. If there's one thing you can be guaranteed to find on a Thinkpad, it's a solid keyboard. That's been true of the line since IBM debuted it decades ago, and it's something Lenovo has maintained ever since it took over Big Blue's computer arm. The X1 Yoga's backlit chiclet keyboard is one of the most comfortable I've used in an Ultrabook. I had no trouble quickly typing up notes and reports from Intel's Developer Conference, or banging out most of this review. The keys are sloped inward slightly, which feels comfortable as you're resting your fingers on them, and they have a satisfying amount of depth. 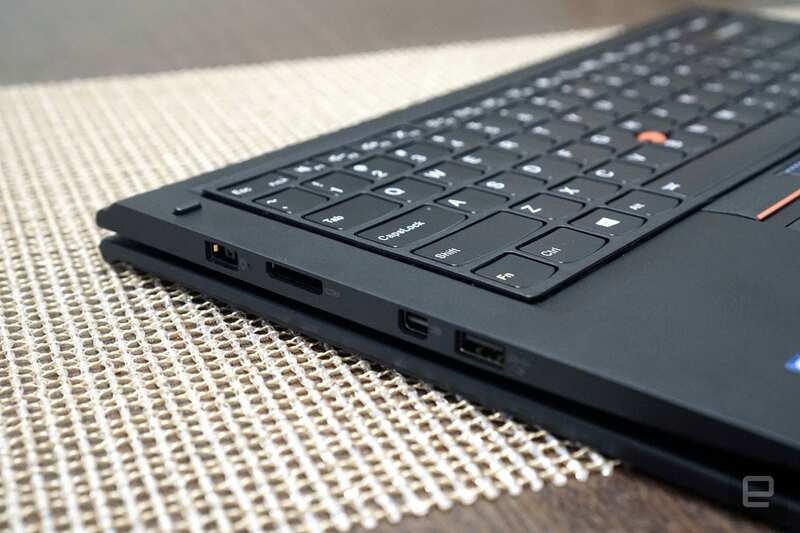 Basically, the X1 Yoga's keyboard feels like a balance of traditional Thinkpad typing with the modern chiclet style. I wish Lenovo included some media keys among its second functions though. Even the ability to start and stop music would be helpful (and being able to move between tracks would be even better). Lenovo used to offer some media keys on the X1 Carbon's capacitive touch strip, so hopefully we'll see those return eventually. The Thinkpad's trackpad is incredibly smooth, though it's not as roomy as the MacBook Air's or those found on other Ultrabooks. And if you're a Thinkpad diehard, you'll be pleased to learn there's also red Trackpoint nub among the keys, as well as mechanical mouse buttons right below the keyboard. For the most part, I relied on the X1 Yoga's trackpad, which was accurate for mousing, though it sometimes got confused between left and right clicks. I'm not a huge Trackpoint fan, but it was admittedly helpful while I was cramped in a middle airplane seat. In situations like that, being able to mouse with just your finger, and without moving your elbows, is immensely helpful.